(CNN) -- NASA postponed the landing of space shuttle Atlantis until Sunday because of weather concerns. 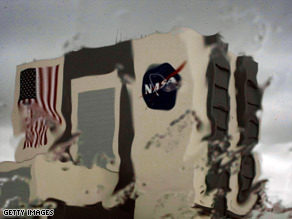 Rain at Kennedy Space Center in Florida canceled plans to land the space shuttle Atlantis on Saturday. The next landing opportunity at Florida's Kennedy Space Center will be at 10:11 a.m. ET Sunday, NASA said. Edwards Air Force Base in California is available as a backup option should landing at Kennedy Space Center not work, NASA said. It was the second consecutive day that NASA had decided to push back attempts to land the space shuttle because of lingering rainy weather in and around the Gulf of Mexico. The space shuttle's astronauts conducted spacewalks during the mission to perform routine repairs and replace key instruments, in what has been called one of the most ambitious space repair efforts ever attempted. Hubble was released back into orbit Tuesday morning. Hubble, which has been in space for nearly two decades, can capture clear images that telescopes on Earth cannot, partly because it does not have to gaze through Earth's murky atmosphere.